The Nutrition Services at Head Start are a very important part of the physical and social development of children. 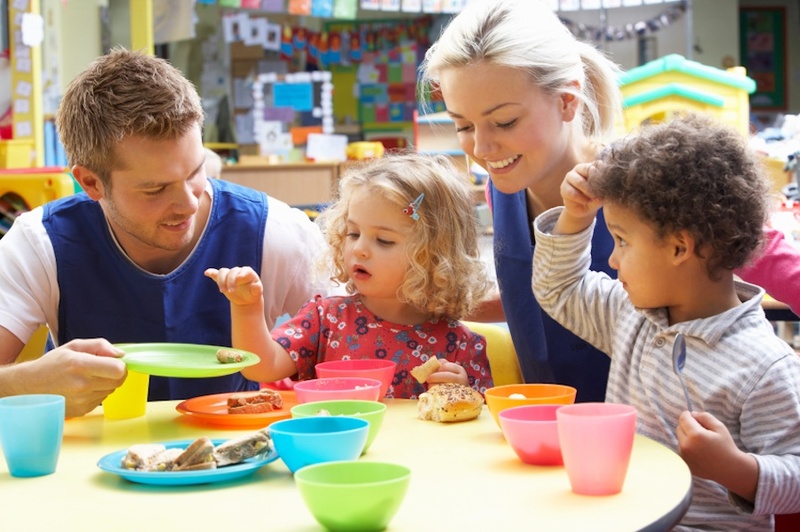 Our philosophy at Bear River Head Start is to promote proper nutrition for children, families, and staff through modeling, teaching, experiencing, and providing healthy foods. HEALTHY FOODS LEAD TO HEALTHY BODIES, WHICH PRODUCE HEALTHY MINDS!! IF YOUR CHILD HAS AN ALLERGY TO A SPECIFIC FOOD, WE MUST HAVE AN OFFICIAL WRITTEN STATEMENT FROM YOUR DOCTOR that a particular food should not be served to your child, otherwise all foods will be offered. An Allergy Statement Form will need to be filled out by your child’s physician. You can get this form from the Health Assistant, or ask your child’s teacher or your Family Advocate. Head Start is a place where children can be exposed to a wide variety of foods. Children are encouraged to try new foods and sample all foods served, however, they are never forced to eat foods they are not comfortable with. Foods are never used as a reward or punishment. Parent volunteers are always needed to help in the classrooms during mealtimes. Volunteers are needed for clean-up of each meal so that the teacher and teacher’s assistant can be more involved with teaching your children. If you are interested in helping each day with mealtime, please let your child’s teacher know. Head Start will pay for you to obtain a food handler’s permit so that you can volunteer in the classroom. A parent who volunteers in the classroom for the full class time is provided with free meals. If you are interested in being a volunteer, please contact us directly. Head Start participates in the USDA’s Child and Adult Care Food Program. This program has specific nutritional and quantity requirements on the food served to receive reimbursement. This program requires that each child enrolled must have a completed Head Start Enrollment Application on file. Parents are NOT expected to provide birthday snacks for the class when their child has a birthday. However, some parents want to participate in this custom. These guidelines are for parents who are interested in providing birthday snacks for their child’s class. Your help in complying with Sanitation Regulations is very much appreciated. Homemade foods (cakes, candy, cookies, muffins, etc.) CANNOT be brought into the center because of State Sanitation Laws. Purchased items must be received at the center in the original sealed containers. Fresh fruits and vegetables must be properly washed at the Head Start Center (supervised by the teacher or assistant). If you choose to provide healthy birthday snacks, remember that it must be purchased rather than homemade and in its original unopened packaging.